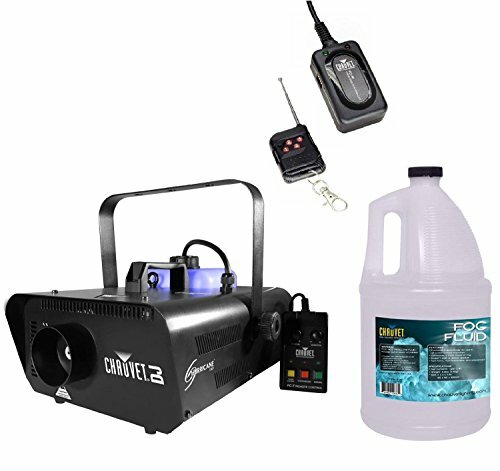 Package Includes: (1) Chauvet H1301 Fog Machine w/ FC-T Wired Remote (1) Chauvet FC-W Wireless Fog Machine Remote (1) Chauvet FJU Fog Juice Gallon ---------- The Chauvet H1301 is an exceptional value! The HurricaneTM Series Foggers provide the quality, performance and innovation for which CHAUVET® is known. All come with generous-capacity tanks and quick heat up of water-based fog to fill a venue within minutes. This product features a 3.3 Liter capacity, a manual fog button, and includes a wired remote! Purchase the Chauvet H1301 Fog/Smoke Machine with VMInnovations and receive free shipping! Also included in the package is the Chauvet Fog Juice! CHAUVET® fluids are designed and tested to provide exceptional output from CHAUVET® fog, snow, and bubble machines. The use of other, inferior products can cause irreparable damage to your machine. Play it safe and get maximum output by trusting CHAUVET® fluids. This fog fluid is water based and works with other products, as well as Chauvet machines.Finally, the Chauvet FC-W is a wireless remote control designed to activate up to four CHAUVET® fog machines independently (separate receivers for additional foggers are required). Two LED indicators display whether the machine is ready or heating. A magnetized back plate on the receiver will hold on your fog machine, and at .2 lbs, the remote will not be a pain to carry. Plus, it works from an unobstructed distance of 100 feet!